Rain showers early with overcast skies later in the day. High around 50F. Winds NNW at 15 to 25 mph. Chance of rain 50%. Higher wind gusts possible..
Cloudy skies early, then partly cloudy after midnight. Low around 40F. Winds NNW at 10 to 20 mph. Fresh homemade strawberry rhubarb jelly with strawberries and rhubarb have been a staple recipe in Union County where rhubarb was once king. Fresh rhubarb is still grown in Southern Illinois. Bunch of fresh picked organic rhubarb. One pound of rhubarb stalks equals two cups cooked. To sweeten, use ½ to 1 cup of sugar for every pound of rhubarb. A railroad map of Illinois prepared under the direction of, and presented by, Cicero J. Lindly, Chas. S. Rannells, and Jos. E. Bidwell, railroad and warehouse commissioners. April 1, 1898. Rhubarb is often combined with other fruits and sugar to sweeten its sharp tart flavor. Early 20th century home cooks found many uses for Rhubarb including jams and marmalades. Amos Poole, a native of Massachusetts was born in 1814 and died in 1894. He was the principle rhubarb grower and became the first to ship the vegetable to the Chicago market. Photo circa 1880. Southern Illinois has a strong agricultural history. Many of our favorite farms and orchards are well over 100 years old and are still owned and operated by the original families. The year 1854 marked a definitive change in the region when the Illinois Central Railroad came through Carbondale with a station in Makanda, beginning a new era of unprecedented growth for our agriculture industry. By 1858, shipments of fruit from Union County to Chicago were becoming significant, and the first strawberries were shipped north in 1860. Special trains were running daily in 1866 to carry fruit north, and just one year later, the strawberry crop required quick daily delivery to get the crop to the Chicago market early the next morning. Today, we are familiar with local strawberries, peaches and apples. These are all plentiful during late spring into the fall, and easily procured at local farmers markets and grocers. While our region has been producing each for generations, Union County was once known as the “Rhubarb Capital of the World”! According to the Union County Farm Bureau, approximately 1,000 acres of rhubarb were being grown in the county around 1912. Rhubarb was being grown in and shipped from Union County long before this, however. 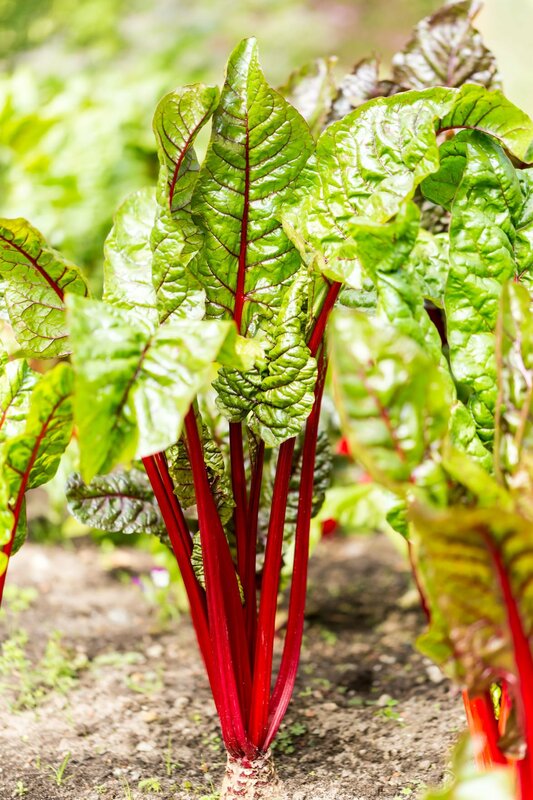 In the 1870s, rhubarb took its place among the important products being grown and shipped, right alongside asparagus, tomatoes, spinach and sweet potatoes. Amos Poole, a Massachusetts native, was the principle rhubarb grower and became the first to ship the vegetable to the Chicago market. In 1880, 50 acres of rhubarb were growing in Cobden with another 25 acres in other parts of the county and it was being shipped by the carload — 465 pounds in that year alone. The net profit was $125 per acre. By 1911, about 300 carloads of rhubarb were shipped from Union County during the growing season. The 1904 Egypt's Big Fair in Murphysboro listed a first place prize for canned rhubarb at $1.00 while the second place winner received $.50. That may not sound like much, but that was a time when a loaf of bread was less than a nickel and a pound of bacon was around 15 cents. In that same year, a scuffle over stolen rhubarb in Murphysboro landed one man in the hospital with a gash in his noggin. Rhubarb is often combined with other fruits and sugar to sweeten its sharp tart flavor. It is actually a perennial vegetable with stalks similar to celery. Unlike celery leaves, however, the leaves of the rhubarb plant contain oxalic acid, which is poisonous. Leaves can simply be trimmed and tossed in the compost bed prior to using the stalks. Historic recipes for rhubarb include our ever-familiar Strawberry-Rhubarb Pie, but also jams and marmalades, pickles and relishes, sherbet and ice cream, puddings and even dumplings. Early 20th century home cooks found many uses for this prevalent food. It was one of the earliest available vegetables in the spring, and known for its ability to aid in digestion and purify the blood. Many old homesteads in Union County may still have rhubarb growing on the land. If you are lucky enough to have some nearby, pick it by twisting the stalks off sideways. Snip the leaves and tough stem off as these are inedible and poisonous — to people and pets. Cut the stalks into bite-sized pieces and cook them in a saucepan over medium heat with a tablespoon of water, and at least one-quarter as much sugar as you have rhubarb. Ten minutes later you have cooked rhubarb. Use cinnamon, citrus zest, or candied ginger to add some zip. Rhubarb was once a very important component of our local agricultural history. While it may have gone a bit by the wayside, it is a versatile vegetable that can be incorporated into both sweet and savory dishes. The hearty plants will yield a harvest 5 to 8 years or longer. Use early spring stems for pies and save the later harvest for sauces and jams as the stalks tend to be pithy. No matter if you grow your own or pick some up at the market this spring, try out a few rhubarb recipes and give a nod to old Amos Poole.